Ocean Princess slot is another three-reel, multi-spin slot from casino software giants, Playtech. With extremely simple gameplay and an average RTP (Return to Player) of 99.07% it draws immediate obvious comparisions with another of Playtech’s slots, Goblin’s Cave. However, where that game has three paylines, Ocean Princess has five. This game strips slots back to the very basics and has the feel of a UK fruit machine from the many high street pubs and bookies. Namely with it’s use of a simple Hold function, that allows the player to Hold advantageous symbols after the first spin in each round. Other than that, there is a simple Wild symbol, and that’s pretty much the whole deal. 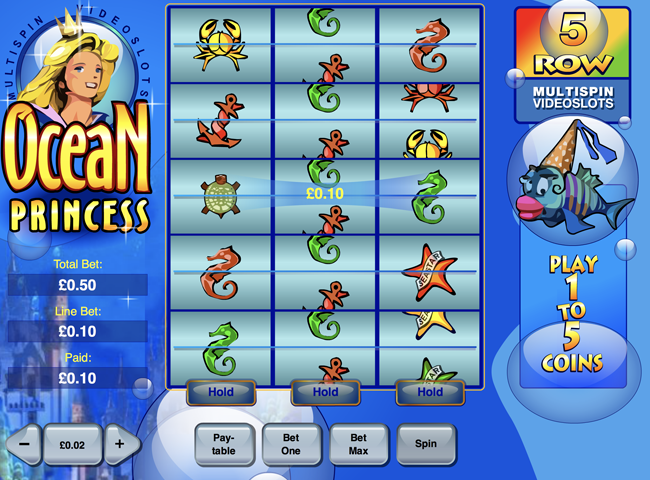 You can play Ocean Princess Slot at any Playtech casino. We recommend Gala Casino or Betfred Casino. There are also many more to choose from our new slots sites. You may be familiar with ocean-themed slots like Mermaids Millions – beautiful blue imagery and golden haired underwater goddesses. So, this game ticks all those boxes. The symbols come in the form of turtles, anchors, seahorses, starfish and crowns. There are 23 winning combinations of symbols in all, from the lowly turtle, one of which earns 1x your bet, right up to the Wild symbol of the crown which pays 1000x your bet. There are five paylines in all in the game, laid out across three reels. The player can choose to bet from 1 to 5 coins per line on a coin value of 0.01, 0.02 and 0.05. Buy adjusting the coin value and bet per line your max bet will be £1.25, and minium bet will be 25p. Ocean Princess multispin slot does not have a soundtrack, just simple sounds to go with each play. There is an option to turn these off in the top right corner of the game screen. The main feature of this beautifully simple game is the Multi-spin and hold function that comes with every game. A first spin populates the bottom row of the reels. The player then has the option to hold any of those three symbols to create a winning combination, or to give the best chance of a winning combination with the second spin. Any symbol that is held will populate each row of the entire reel it is on. Then, a second spin populates the rest of the rows, revealing up to five winning lines. Wilds – the only other significant piece of gameplay in Ocean Princess is the Wild symbol, or the crown, which substitutes for any other symbol on the reels to create a winning combination. It also brings in the highest payout of 1000x if the player lands 3 in a row on any payline. You couldn’t get any simpler than this 3 line slot from Playtech, but that doesn’t mean it can’t be a lot of fun. For those who like to keep it old skool, this slot with it’s retro Hold function and big payout table has a lot to offer. With an overall low to medium volatility, a low stake range and an RTP of 99.07% many low stakes players, or those seeking to turn over bonus funds will find enjoyment in Ocean Princess Slot.